The Worst Book of 2007? Gene W. Heck has an impressive biography, being "a senior business development economist operating in Saudi Arabia and throughout the Mideast. Prior to joining the private sector, he was a member of the United States Diplomatic Corps, with postings to the U.S. embassies in Saudi Arabia and Jordan. He also serves as adjunct professor of government and history with the University of Maryland." 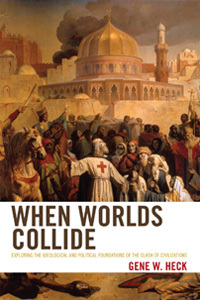 Gene W. Heck's "When Worlds Collide: Exploring the Ideological and Political Foundations of the Clash of Civilization." There is nothing bellicose about the Koran, which is no more aggressive than the Old Testament. Islam's theological differences with Judaism and Christianity are "surprisingly limited." The Shari‘a is completely consonant with the Hague and Geneva Conventions. Jihad frequently means "the unending struggle of the devout to be good Muslims." The Wahhabi movement is innocent of aggressive intentions. Today's troubles go back to the efforts by Western intelligence agencies to further their own interests by sponsoring Islamist organizations – notably British backing for the Muslim Brethren in Egypt and American backing for Islamist groups in Afghanistan. Al-Qaeda is basically a Muslim Brethren offshoot. "Anglo-American democracy" is exactly what the Muslim world does not need; theocracy is the ticket. If Westerners want to help Muslims, they should send them money. Disclaimer: Heck mentions me (along with Robert Spencer, Bat Ye'or, David Littman, and Ibn Warraq) as one of those who decry "present perceived religious suppression, presumed political discrimination, and alleged civil rights violations in certain Middle East states wherein Islam today is practiced." Well, yes, I guess I am guilty of decrying those perceived, presumed, and alleged problems.